Dental crowns are one of the most effective dental solutions for restoring a tooth’s shape, size and strength, or to improve its appearance. 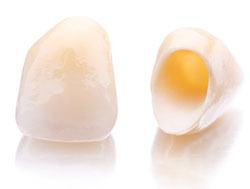 Porcelain crowns can be used to cover discolored teeth or dental implants, protect a tooth from decay, restore a broken tooth, or to hold a dental bridge in place. During your visit, we will take a digital X-ray to examine the extent of decay before removing the damaged surface. We ill then take an impression of the prepared tooth and place a temporary crown to cover the tooth while the permanent dental crown is being made. Once your crown is made, we ill remove the temporary crown, check the fit and color of the permanent crown, then cement it in place. Veneers are thin, porcelain shells that are attached to your existing teeth to meet a variety of cosmetic goals. We can match them to your natural or desired tooth color for a uniform, authentic appearance. Porcelain veneers are also highly stain-resistant and may actually strengthen your natural teeth. Rather than spending years with braces or multiple appointments for bonding, teeth whitening and other cosmetic procedures, Robinson Dentistry can completely transform your smile with teeth veneers in only two visits.